Defying convention, Souls games are often harder at the beginning than the end. Take for instance the long run to the Taurus Demon in Dark Souls, or if you’re a PlayStation moonlighter, the brutal slog to the werewolves early in Bloodborne. But as tough as these sections are in themselves, the real challenge is in learning each game’s particular rhythm: keep your shield up and wait for an opening in Dark Souls, then unlearn those habits for Bloodborne’s more aggressive approach. 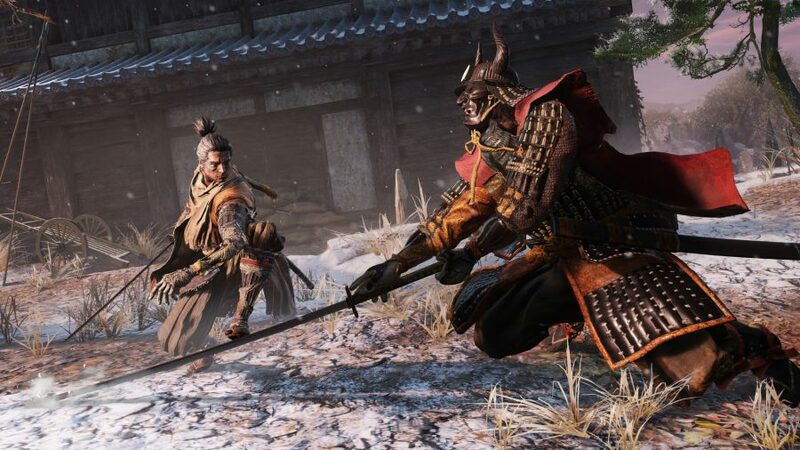 Sekiro demands the same dedication, even more so than its predecessors. It’s difficult to imagine anyone other than FromSoftware and Souls creator Hidetaka Miyazaki being so bold, but given their extraordinary run of form since 2009’s Demon’s Souls, they’ve earned our indulgence. And my word, how it pays off. At first I thought Sekiro was the hardest Souls game I’d played – and, just to flash my credentials for the ‘git gud’ crowd, I’ve completed them all, earning every achievement in Dark Souls. But experience doesn’t count for much: I got my arse kicked by Juzou the Drunkard and Lady Butterfly more times than I could count before finally prevailing. I was just hitting my stride at the top of Ashina Castle when my save file corrupted, erasing 16 hours of bitterly hard-won progress. I was pretty crushed, but I started over, and amazed myself as I reached the same point in a third of the time. 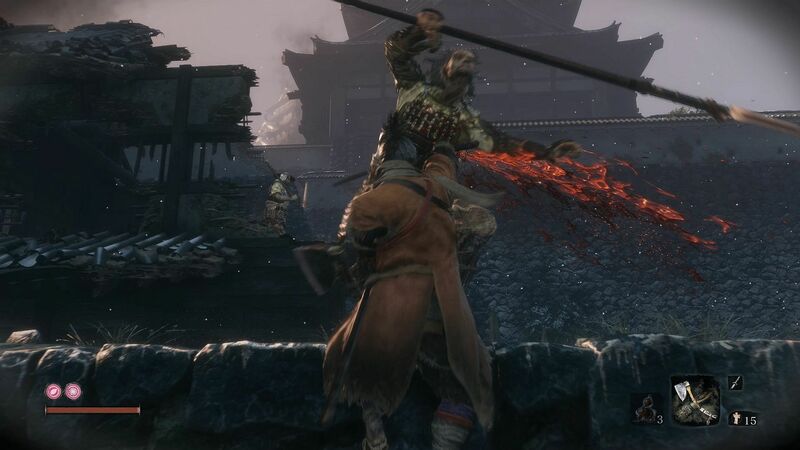 In Sekiro’s climactic hours, certain early minibosses become regular enemies, and now I’m killing them without breaking a sweat. This feeling – that it’s really yourself rather than your avatar that has grown stronger – is part of what defines Souls games. 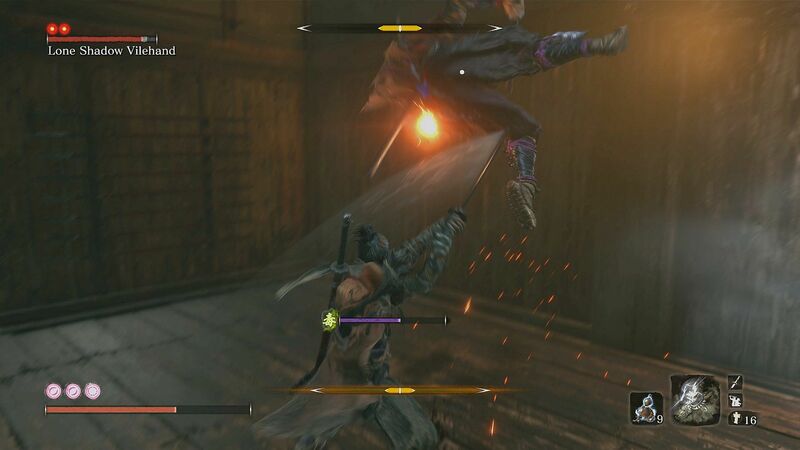 Sekiro takes it to new heights. Combat is the most important and demanding system to learn. You can deflect most enemy attacks, and if you get the timing dead-on, a satisfying clink of swords indicates you’ve damaged their posture. Break their posture entirely and you can deal a ‘shinobi deathblow’. Regular mobs can be killed like this or by depleting their health the old-fashioned way, while bosses require multiple deathblows to finish. It’s the game’s biggest hurdle, which is why there’s an immortal and, thankfully, friendly NPC who will let you practise by killing him over and over again. When it all goes right and you deflect every blow in a boss’s multi-stroke combo, you feel like punching the air in triumph. But you can’t because you’re in the middle of a fight, so the achievement sits unexpressed inside you, fizzing joyfully in your veins. Such elation doesn’t come cheap: bosses in particular like to vary their swing speeds, and there are attacks which can’t be blocked but must be dodged or jumped over. Like a fighting game, it demands accurate reflexes and intense concentration, and like a Souls game, it demands dying a lot while you learn your opponent’s patterns. Combat can feel a little bare until you unlock new moves, but that’s for the best. Being forced to master the fundamentals reveals their depth, and is crucial training for the rest of the game – because unlike Dark Souls, there’s not really a crutch to lean on. Sekiro is a traditional single-player game, so you can’t summon a friend for a little jolly cooperation. Your powers of resurrection - so often taken for granted in other games - are once again given an elegant narrative justification. But die too much and you'll strain this gift, and spread a disease called Dragonrot to other hapless victims. I love this. It’s such a twisted idea, and compounds the feelings of self-loathing that dominated my first playthrough. FromSoft has also jettisoned the RPG-style level-up system. Your character – a ninja known as Wolf – does get stronger, but in a much more controlled way. You improve health and posture by collecting prayer beads, and improve attack power by contemplating the bosses you’ve killed. These resources are both finite, so you can’t farm souls to overwhelm enemies with raw strength. You can farm resources, with which you can upgrade the many gadgets in your prosthetic arm, and skill points, with which you can unlock new abilities. Some of these can make a huge difference in fights, and no less importantly, some of them just look frigging cool. Shadowrush is a particular favourite: a long-range lunge that ends with you flipping into the air like something out of a wuxia movie. It all adds up to a thrilling combat system that somehow marries button-mashing intricacy with great visual drama. Slick, blood-soaked animations dynamically produce cinematic duels with even ordinary mobs, and when it raises the stakes, FromSoft continues to earn its reputation for spectacular boss fights. Just imagine duelling a half-naked samurai atop a castle in a blizzard while he throws lightning at you, blades ringing as they clash. Navigating the world is no less exciting. You can hang from ledges and sidle up to walls like Solid Snake, sneak through tall flowers like the siblings from Assassin’s Creed Odyssey, or swing through tree branches like Batman, thanks to a grapple-hook in your prosthetic arm. This has had a big impact on world design: the usual linear levels regularly unfold into the most open, intricate, and vertiginous spaces yet seen in a Souls game. It’s beautiful throughout, defined by scenic temples and snowbound valleys that could’ve been painted by Katsushika Hokusai, albeit with a dark touch of Japanese mythology. Ashina Castle is a prime example of this. Majestic gable roofs loom over claustrophobic streets, presenting a tempting array of targets for your grapple. By chaining grapples together you can swoop over the enemies below without touching the ground. On another occasion I swing across a canyon via a kite, only to find myself isolated on a cliff with no onward grapple point. Distantly, a glowing item beckons, and taking it as a hint, I make a leap of faith towards it. Sure enough, the fall brings me within range of something to swing from. I can’t help but smile. It’s a lovely moment that shows a thorough understanding of what the player will do and how much, or how little, prompting they need to do it. Sekiro is full of moments like this, which reward your initiative and observation: a boss might seem impossible until you eavesdrop on a conversation, or re-read an item description, that reveals a tactic you hadn’t considered. There are still a few items that feel redundant – unless my piles of useless ceramic shards can be assembled into a priceless vase – but with these few exceptions, everything feels purposeful. It’s very reassuring, as if you are in sync with FromSoft’s designs; a kind of telepathy. I love conceiving these plans, and it’s great when they work out – but sometimes they don’t. 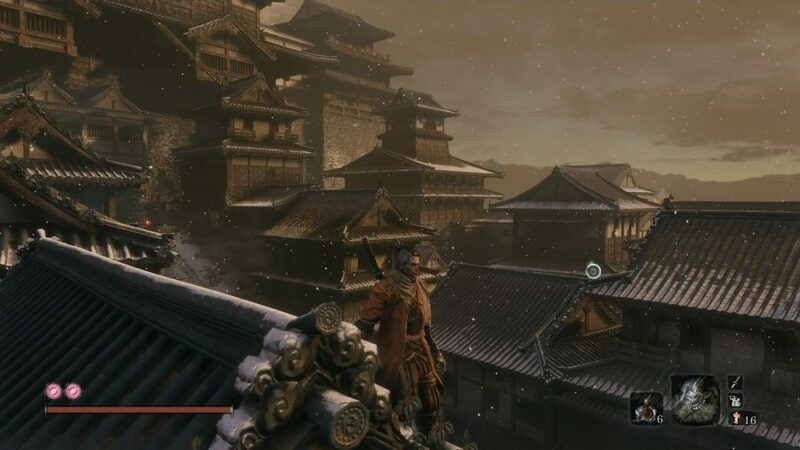 Most actions will cause you to exit stealth – sprinting, jumping, grappling, and killing will all do it – and Sekiro’s enemies are not blind, so you shouldn’t expect to go unnoticed just because you’re on a roof. However, they are implausibly forgetful: once detected, you can run and hide somewhere for a while until everyone develops amnesia. This kills the pace, creating pockets of dead space where you’re doing nothing. This is typical of the stealth genre, but it feels like an inelegant compromise of the kind that FromSoftware doesn’t usually make, and taints an otherwise sublime game with mere competence. Your master, Lord Kuro, is a great character. Routinely showing more wisdom and decency than the megalomaniac warlords around him despite his young age, you will come to admire him. This later leads to a dilemma unlike anything in Souls, when your duties as a shinobi are examined. In fairness, Miyazaki has said that stealth is only intended as a supplemental system to the action, so it’s wrong to think of Sekiro as a dedicated stealth game. I’m not sure this dodge entirely works: engaging enemies on your own terms is a huge advantage, especially when it lets you halve a miniboss’s health before the fight actually starts. This means it isn’t easy to just shrug and carry on if you’re detected, so I often felt pressured to reset stealth. Hence: dead space. You can mitigate some of this by investing in skills that make you harder to detect. Later on, you even get one that lets you vanish in a cloud of bloody smoke after every backstab. So stealth becomes a lot more enjoyable and viable if you embrace it, which reflects the fact that it’s really just a playstyle preference. Finally, a brief word on Sekiro’s story, which is more intricate than that of Dark Souls. In Souls and Bloodborne, you are an anonymous visitor to a world collapsing into entropy or madness. 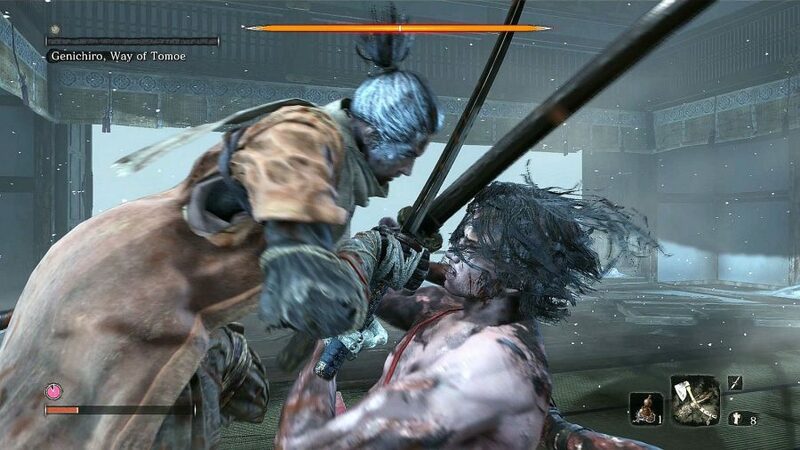 In Sekiro, Wolf and his master are placed at the centre of events. FromSoft still manages to conjure its trademark air of isolation and creeping dread, however; Wolf may have an identity and a history, but he has mysteriously forgotten much of it. You piece together his memories alongside him, and may not like what you find. 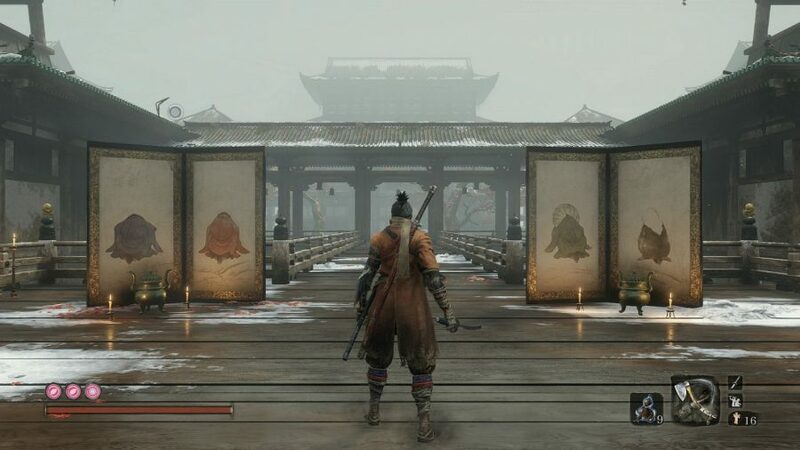 It has been a privilege to play Sekiro. It’s more sensitive to your own skill than any of its predecessors in ways that are at first enfeebling, and then empowering. It’s a shame that this experience has to come at the cost of difficulty that will limit its audience, because it deserves to be enjoyed by everyone. But better that than compromise any part of it. Boasting the best swordfighting in the business, Sekiro is a game of rare but deserved self-assurance. You’ll despair as it breaks you down, but then you’ll exult as it builds you up. It’s a journey like little else in gaming, and if you’re up for the challenge, you absolutely have to play it.